Watershed Software, Inc., led by a husband and wife team in San Jose, has just published its first software title, called SalesPowerTM which is one focus of a software process called CompuMindTM. Skeptics might call it Ouija Self-Help for Salespeople. Except it seems to work without sleight of hand. The brainchild of psychologist Clark Cameron and his hypnotherapist wife, Sharon, SalesPower uses a computer and "The Cameron Method," a process to change negative subconscious attitudes. 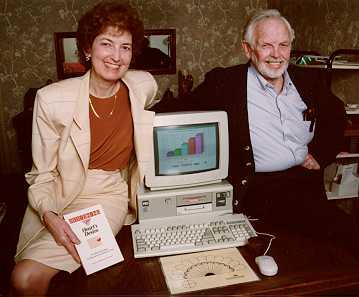 With a PC, a mousepad-size chart bearing a figure resembling the NBC peacock, a brass jingle-bell shaped ball on a simple chain (the "Indicator") and their software program, the Camerons claim one can improve anything, from career success to love lives. But users must accept the system's fundamental premise that attitude and experiences are based in subconscious beliefs, and those beliefs can be changed. The process uses ideodynamic motor response, a form of biofeedback. As the user dangles the ball over the chart, the program asks a question such as "How strong are your positive feelings about your sales ability?" The ball swings toward the number on a form matching the user's percentage of emotional intensity about the issue. In a test run, Ms. Cameron demonstrated one part of the Cameron Method: If you have an inner belief, your body will reflect it in an ideodynamic motor response. And if you desire, you can release it. A volunteer held his arm out, parallel to the floor. As he said his name Ms. Cameron pushed down on his arm as he resisted. His arm stayed put. Then she asked him to say his name was Betty Jo. His arm swung down like an egg noodle, unsupported by his mind's conviction. Then Ms. Cameron asked him to say the releasing statement, "I release my belief, perception and judgment that my name is not also Betty Jo." After he repeated the statement, she tested the statement with the arm response and it was strong. Can the Cameron Method make a man believe he's a woman? "Not really." Ms. Cameron said, "The point is to show that with one releasing statement, we can affect even the most powerfully held beliefs." So, SalesPower sticks to refashioning subconscious attitudes that can impede success on the showroom floor, trading floor or in any other environment. The software tracks the percentages reflected by the Indicator, then helps users work on areas they choose. The program uses releasing statements such as, "I release my belief, perception and judgment that I am not a good enough salesperson." Or, "I release all fear that rejections on cold calls mean I can't be good at my job." The releasing process is detailed in the book, Designing Your Heart's Desire: The Releasing Strategy, by Sharon Cameron. After releasing the beliefs, the software cycles back to the self-testing phase, comparing the percentages, before and after with bar charts. If this seems high tech-high touch, it is. As you might have guessed the Camerons are not your usual software entrepreneurs. They moved to San Jose from Atlanta in 1985, after Dr. Cameron conceived the idea of translating their therapeutic method into software accessible to the masses. "Silicon Valley was the logical place to implement such an idea," he said. The Camerons plan to produce custom versions of CompuMind for niche markets, which could include managers, accountants, and human-resource personnel.